Skeptical Science wins the Eureka! A Queensland physicist’s war on global warming skeptics has seen him win the 2011 Eureka Prize for Advancement of Climate Change Knowledge. John Cook is a Research Fellow in climate communications at the University of Queensland’s Global Change Institute. Cook’s war on global-warming deniers began in 2007 with his website, Skeptical Science. His idea was simple: “to make peer-reviewed science the ultimate authority”. He chose the name “Skeptical Science” because he believed the word had been misappropriated by the deniers. 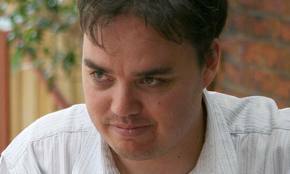 Skeptical Science received international recognition in 2010 when Melburnian, Adam Kierce of Shine Technologies, converted the website into an App. Its “Top Ten” rating by The Guardian resulted in over 72,000 downloads. As a result, Skeptical Science’s popularity skyrocketed with monthly hits of over half a million and an international reach of twenty languages. For Twitter fans, a new weapon has been added to Skeptical Science’s arsenal. The ‘Twitter-bot’ is a collaboration with software developer, Nigel Leck. Leck’s ingenious software acts like a reverse search engine patrolling ‘Twitter’ for common myths on climate change. Posing as a live ‘Twitterer’, it fires off a volley of peer-reviewed scientific ‘tweets’ in response. The book, Climate Change Denial: Heads in the Sand, with foreword by Professor Naomi Oreskes and co-authored with Haydn Washington, was published last year. A growing list of science and academic experts – Michael Mann and Professor Naomi Oreskes among them – have endorsed Cook’s Skeptical Science as the “go to” web resource on climate. Earlier this year, David Suzuki, joined them: “There are many credible sources of information… One place to start is at skepticalscience.com.” A growing list of science and academic experts – Michael Mann and Professor Naomi Oreskes among them – have endorsed Cook’s Skeptical Science as the “go to” web resource on climate. “A few different college courses are now using our site in their curriculum – for example Portland State University (Debunking Handbook) and Suffolk County Community College (website). Shine Technologies has followed its app with a Skeptical Science Firefox Add-on that has two major functions. It interfaces as you surf websites and blogs, checking arguments and responding instantly with both short rebuttals from Skeptical Science as well as the full URL. Its secondary role is an interactive one and offers a way to join Cook’s war on global warming deniers. As you browse the web, the Add-on allows you to submit climate links and peer-reviewed papers to Skeptical Science’s database.